This is an #AAF: an Automated Assumption Fail. 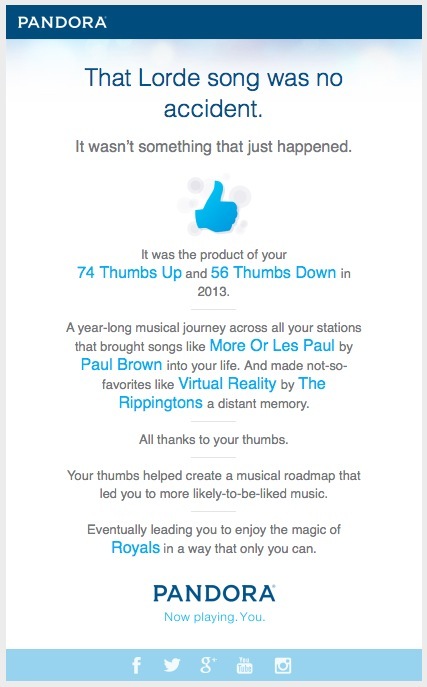 I love music, and Pandora; but what Pandora’s telling me here doesn’t square with my experience of using it. I mean, what is “that Lorde song”? Who are are the Royals? Maybe I do like them, but I don’t recognize them at the moment. We believe that you are in Spain [snip]. If you believe we have made a mistake, we apologize and ask that you please email us. I also assume that there is a lot of #AAF in the absurd and counterproductive licensing restraints Tim talks about in his letter to blocked visitors. Really, it’s crazy that I can listen to all the music on SiriusXM, Apple’s iTunes, websites and countless mobile apps — including TuneIn, AOL, Public Radio Player, Stitcher, rdio, iheartradio, and Wunderadio — while Pandora is blocked. Why would Spain pick on Pandora and not the rest of them? Just because it’s popular? I dunno. And, speaking of #AAF, when I go to Google to do research, its robot brain assumes I’m Spanish, even when I’m logged in to Google as my 100% American self. When I check less fancy and presumptuous search engines, such as DuckDuckGo and StartPage, I still have to do too much digging, because the engines assume I’m searching for something other than the question of why Spain blocks Pandora. So I’ll leave it up to the rest of you (or the fullness of time) to complete that work. Let’s be clear: #AAF is not the fault of Pandora, Google or any other outfit needing to scale its dealings with many different people. It’s the fault of the industrial model that has been defaulted ever since industry won the Industrial Revolution and mass manufacture and marketing was required for scale. It is also unavoidable in an all-silo marketplace, which is what the Web, with its calf-cow architecture, has become. In this architecture, every outfit maintains its own relationship silo, each of which bears the full burden of dealing with thousands or millions of different human beings in scalable templated ways. This problem cannot be solved by #YAS — Yet Another Silo — of any kind. We are all different, even if we are easily templated by others. This absolute individuation is a base-level human condition. We live in a fully networked world, in which each of us is our own node. The only way we can truly relate, as complete and independent human beings, with full agency, is from our own silos, within which reside the means to relate directly with every other entity we engage. Think about it: our bodies are silos. That #3 point is the development challenge for the 21st century. The tech sector has been working since 1995 on empowering the vendor side of the marketplace, helping companies, sites and services get their own scale, every one of them with its own silo — together compounding inconvenience won the personal side. Thus every “solution” on the vendor side complicates the problem. This is a problem that can only be addressed on the individual side. Personal computing and networking create the base conditions for solving the problem, but we need more. We need universal engagement tools for individuals. That category is a $0 trillion greenfield that’s wide open and ready for exploiting, right now. Remember: personal computing was an oxymoron before it took off in the ’80s. Networking was entirely an organizational grace before the Internet came along. Likewise with clouds. Right now almost the entire cloud conversation is corporate: B2B. So is the “big data” conversation. Today’s prevailing jive about both are sure signs that they’ll become just as personal as computing and networking. When clouds do become personal, they will also be private. By that I mean we will control our own private places, spaces, relationships and interactivity in the networked world. (Those will also be programmable, e.g. with KRL.) Once we have personal clouds, based on standards that work for all of us, we will be able to relate in our own ways with everybody and everything else. I believe it’s exactly in this direction that Fred Wilson was headed in his talk at Le Web (which I visited a few days ago), and where Bruce Schneier, Eben Moglen (separately and together) and other freedom-lovers are also headed as well. It is toward that long vector that I bring up #AAF as a problem. Meanwhile, let’s not burden the Pandoras and Googles of the world with solving it. They can’t. We can only solve it for ourselves — and then, as a consequence, for them. Finally, thanks to @TimWestergren and @Pandora for providing modest evidence of a problem for all of us — and a path toward solving it. Thanks, Nathan. Agreed. I learned the distinction from Devon Loffreto (@NZN), whose blog is The Moxy Tongue. Highly recommended. I suggest starting here. Hi, I’m not really sure I caught the word, but is Pandora’s agreement problem linked with collect of personal data ? We don’t have it here in France so I can’t tell, but agreement for data collection and property has been a tremendous debate in European Parliament recently. Does anyone knows ? Thanks, Anne. I’m back in the States now, but will use that hack when I’m abroad again.